But diving into a relationship can’t be so simple. Being together means Trevor risking the last link he has to his son… leaving Jesse to wonder if he’ll ever be enough, or if Trevor will always be haunted by the past. Whew! Get the tissues close by when you read this book. It is full of emotions that will eat at you. Jesse is Riley's best friend. They went through basic training together and have a bond that most brothers would envy. Riley grew up in a non-traditional home – he was raised by his father, who he knew was gay, but never truly had partners until Riley was an adult. Riley sees in Jesse behaviors that he also sees in his dad. But being the good and supportive friend he is, he allows Jesse to come to him. When they are deployed, their lives become more real – they are thrust into situations that, while they are trained for, they really shouldn't be dealing with at their age. Riley's dad, Trevor, and his partner are hoping and praying that everything will turn out well for Riley. However, Trevor's partner isn't Riley's dad, he's mainly concerned with how Trevor will handle his son going off to war. You see the tension between them and wonder if they will truly last in their relationship. Jesse and Trevor are trying to cope with all that has happened and in doing so, form a bond that not many others would understand. They both loved the same person in different ways. The title is so fitting for this story because it truly is their point where they come together. It's sad, honest, and gritty, as well as romantic and healing. These two find a way through grief and heartbreak to a place of peace and acceptance. This book was heart wrenching but so good. I don't know if the author personally experienced this subject or someone close to them did, but I felt like I was experiencing it with Trevor and Jesse as it was happening. My heart hurt, I cried but I also found hope and love along the way with Jesse and Trevor and their journey. The epilogue was amazing, and I found myself smiling and crying at the same time. Beautiful, heartbreaking story that so many people have gone through; it gives us who haven't, their perspective so we can be more sensitive and more supportive. I just loved this book and can't say enough good things about it. This was a messy cry book from start to finish. Riley, Trevor, and Jesse all feel horribly real and the author captures the suffocating intensity of Trevor’s grief with heart rending authenticity. This is a beautiful story but was a difficult book to read and a hard book to process. The story unfolds on either side of Riley’s combat death. We get to know Riley as Trevor’s son and Jesse’s best friend and battle buddy. We see the joys, the playful moments, and the meaningful interactions before Riley dies and the knowledge makes Trevor and Jesse’s experiences after his death all the more poignant. I really loved this story. I wasn’t sure about the age gap between Trevor and Jesse when I started the book and the best-friend’s-father thing still doesn’t sit perfectly with me. But ultimately, I understood Jesse and Trevor together. The two are bound together by horrific experiences and they fit each other beautifully. This is a special story. Readers will need to be in the right headspace for the book but it’s not a story I will soon forget. 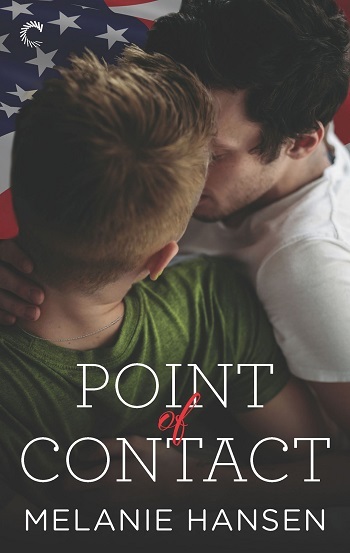 Reviewers on the Wicked Reads Review Team were provided a free copy of Point of Contact by Melanie Hansen to read and review.